A Cherry blossom tattoo can be incredibly feminine, but that doesn't mean that men can't incorporate one into their own body art. Learn more about this design and what it means. Delicate blush-colored petals and cherry-toned stamens in lovely clusters; what's not to love about cherry blossoms? They have a simple beauty that doesn't overwhelm their surroundings, but rather accents them. Whether you're viewing a single blossom or a tree filled with them, they're still lovely to behold. It's no wonder that these flowers are often used in tattoos. 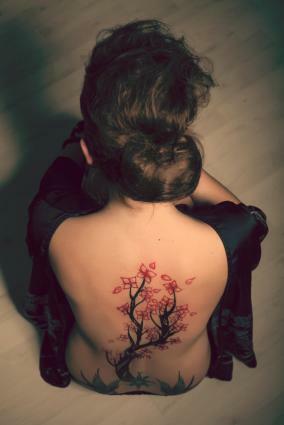 A cherry blossom tattoo can be enjoyed strictly for the beauty of it, but this flower does carry various meanings. First and foremost, it's considered a symbol of feminine beauty, especially in Asia where cherry blossoms are regularly incorporated into all kinds of art. These flowers are also used to express how fragile life is. They burst into bloom in the spring, only to cover the landscape in snow-like petals a short time later. The lesson in this is to enjoy life to the fullest while we have it. This is good symbolism for any tattoo. In China, these blooms are considered the flower for April, so if you happen to have an April birthday, you might consider this type of tattoo to commemorate the event. According to the language of herbs, cherry blossoms stand for love. Picture two blooms with your names and a wedding date imprinted in script lettering on the petals. 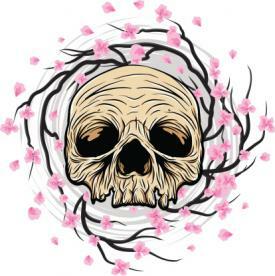 Falling blossoms and petals also stand for death and loss. You can use a design of this nature to memorialize a close friend or loved one. 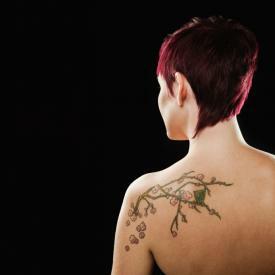 For women, the design potential for a cherry blossom tattoo is nearly unlimited. A small cluster would look lovely in an upper chest tattoo just below one of the shoulders. For anyone who is willing to go with more ink, consider a half sleeve of blooms from your shoulder to just above your elbow. The muted colors used in this design will keep even a large tattoo looking quite feminine. Alternately, you might consider a larger cluster of blossoms on the outside of your calf.Due to the naturally feminine connotation assigned to cherry blossoms, some men may not feel they are a good choice for a stand alone tattoo. However, these flowers are a fabulous choice for men when they're worked into a larger Asian theme chest or back piece. They can accent a tattoo of the Japanese countryside or a tiger tattoo, and even look good stretched over a Koi pond tat. Once you start thinking about it, there are many ways to work these flowers into a design. Butterflies: The beauty of butterflies is that you can do virtually anything with them. Choose a realistic butterfly image, or let your fantasies run wild with color and wind styles. Hummingbirds: Again, you can take a lot of license with the colors you choose for a hummingbird. Your choice can make the bird the focal point for your tat, or you can keep the shades muted so your cherry blossoms don't simply fade into the background. Bonsai trees: Give your cherry tree the bonsai treatment complete with twisting trunk and gnarled branches. It looks absolutely awesome. Asian scenery: Picture a snow-capped mountain range in the background, a cherry tree in the mid-ground and perhaps even a peacock strutting in the foreground. Now that's a design with depth. Dragonflies: A single dragonfly hovering above a few blossoms adds more interest to a simple tattoo. With so many possibilities for cherry blossom tattoo designs, you should probably take your time narrowing down your favorite ideas until you reach two or three favorites. You can take those to a tattoo artist who can help you match the right design with the right placement so you wind up with a fabulous tattoo.